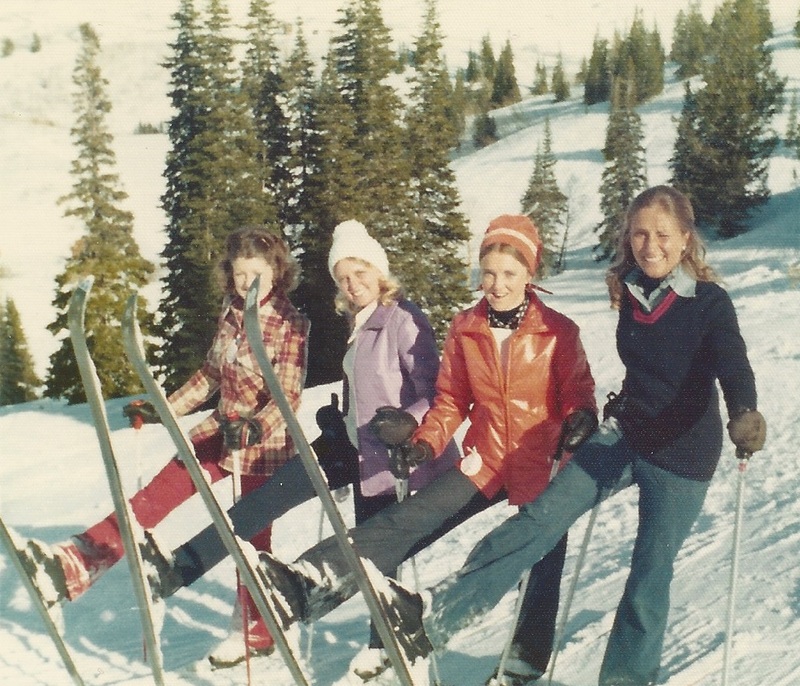 Above: Weber State College friends in 1973 Left to right: Nancie Berlin, Sandi Brown, Janeen John, and Jan Hall. 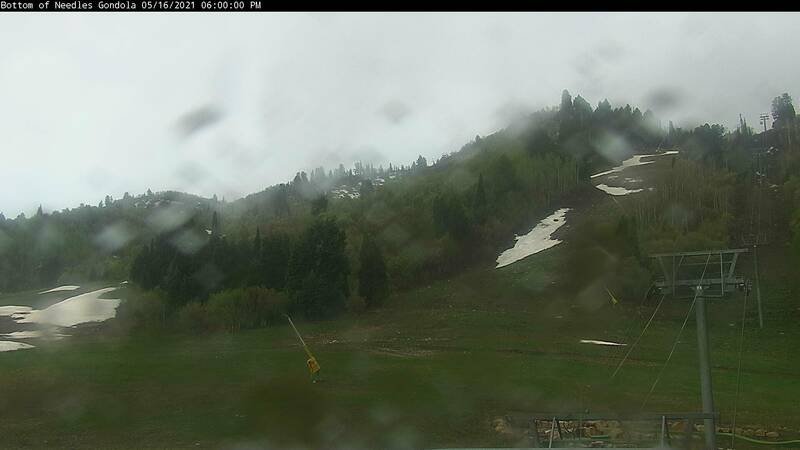 Snow Basin continued to grow in the 1970's. There were plans in the works to add a lift in the Middle Bowl area and to replace the Wildcat single chair lift. Freestyle skiing became popular in the United States and Snow Basin was no exception. Many great freestyle athletes grew up in the Ogden area and Snow Basin became a freestyle skiing mecca. 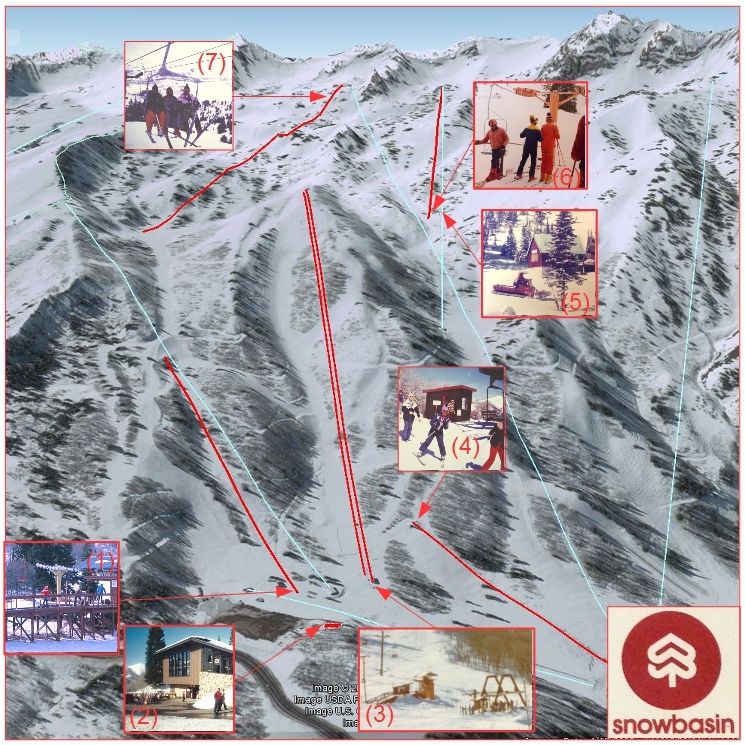 In the late 1970's, Snow Basin was sold to a pioneer in the ski industry and it looked like Snow Basin was going to become a mega-resort. 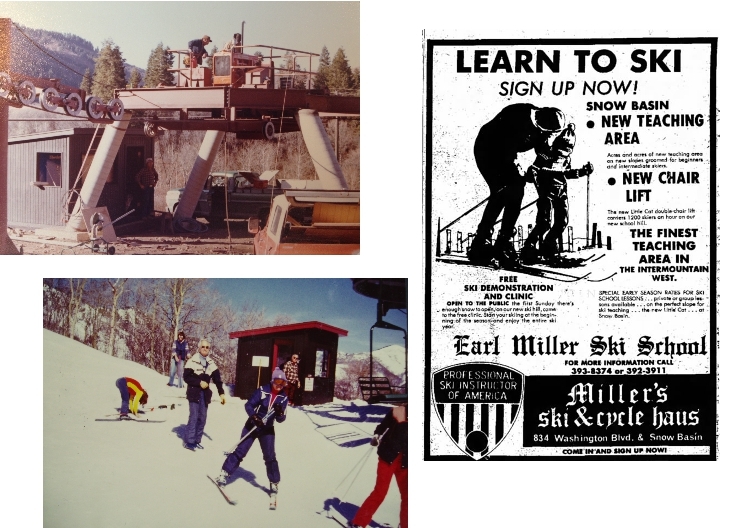 In the summer of 1973 Snow Basin constructed its first triple chair lift on the location of the Wildcat single chair. The new lift was designed & fabricated in Utah by Thiokol Corp. The new lift could haul 1200 passengers per hour and was 5300 ft. long with 1420 ft. vertical rise. The Wildcat triple was the workhorse for over twenty-five years until the Needles Gondola was installed in 1997. You can still take a ride up memory lane on this classic triple most weekends and holidays. Above: The new Wildcat triple lift under construction on the left and the Wildcat double lift on the right. Source: Ralph Johnston Collection. Freestyle skiing started in the 1960's but it's heyday was in the 70's. 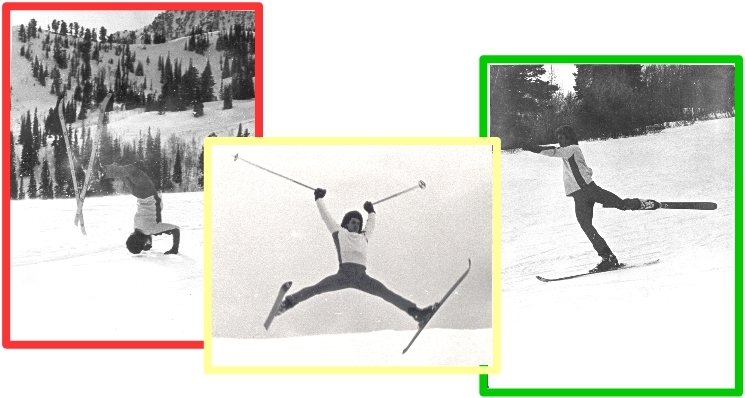 The first sanctioned competitions for freestyle skiing were held in 1971. Early Freestyle covered three disciplines: Aerials, Moguls and Ballet. 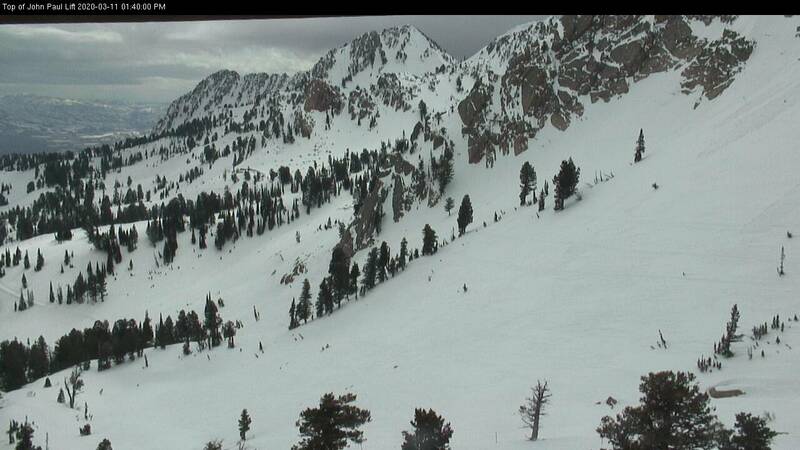 The Ogden area and Snow Basin was a hub for freestyle skiing with several local skiers competing nationwide. 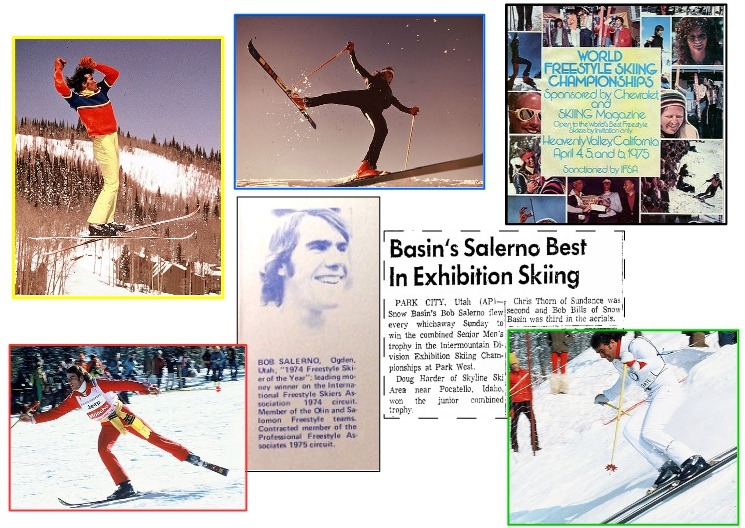 Local Skiers like Bob Salerno, Robert Young and Jeff Hyde. 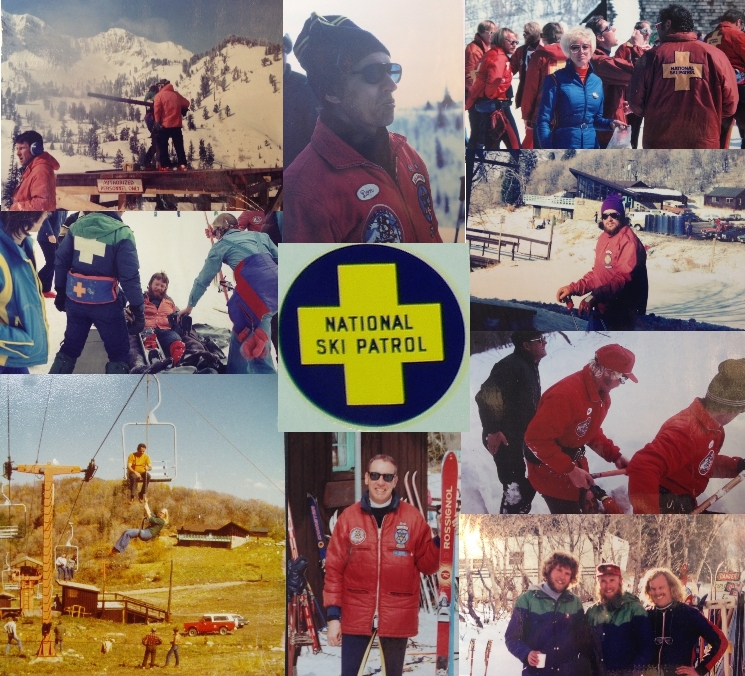 The Snow Basin Ski Patrol in the 1970's was headed by Don Wilson and was known as one of the top ski patrols in the Intermountain. In 1973 Don Wilson was named “Outstanding Professional Patroler of the year for the entire nation”. I would personally like to thank Don for taking the time to share his photo collection, articles and time. Constructed in the summer of 1976 the Littlecat double chair lift replaced the Powder Puff T-Bar and was placed in a new location that ran parallel to City Hill. 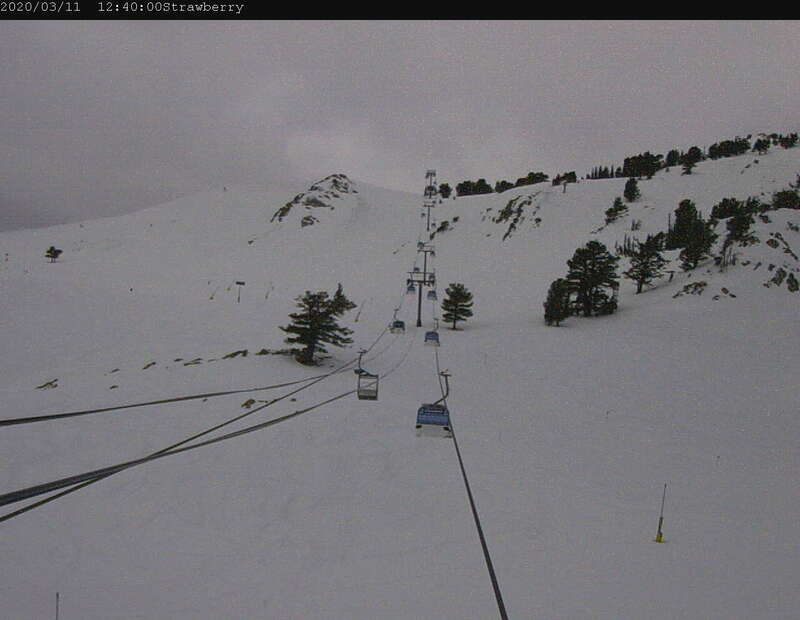 The new lift site offered both beginner and intermediate terrain. The new lift was also designed & fabricated in Utah by Thiokol Corp and could haul 1100 skiers per hour was 1565 ft. Long with 235 ft. vertical rise. When Earl's lodge was constructed the Littlecat Double had to be shortened to 1526 feet and the loading station was replaced with a modern Doppelmayr system with a hydraulic tensioner. 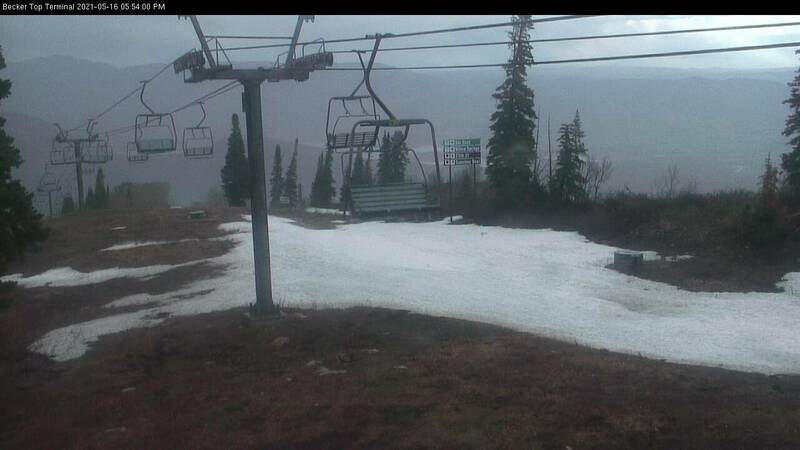 The Littlecat double was removed in 2007 and a new HS Quad was placed where the Powder Puff T-Bar was located. 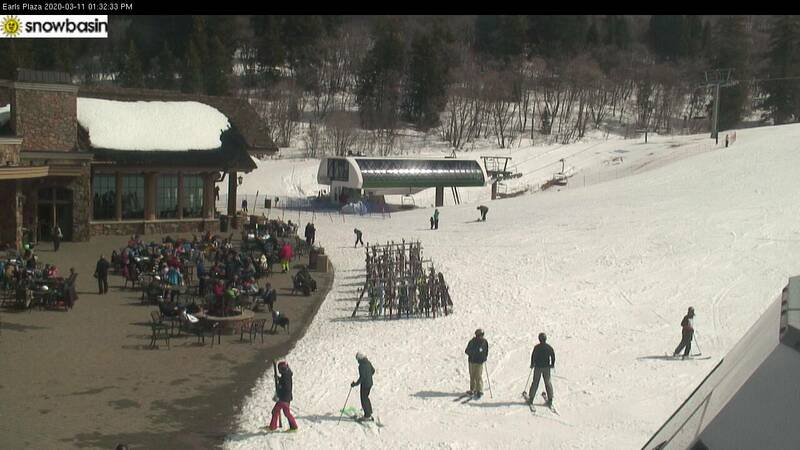 The double chair that is located in the plaza is from the Littlecat double chair lift. 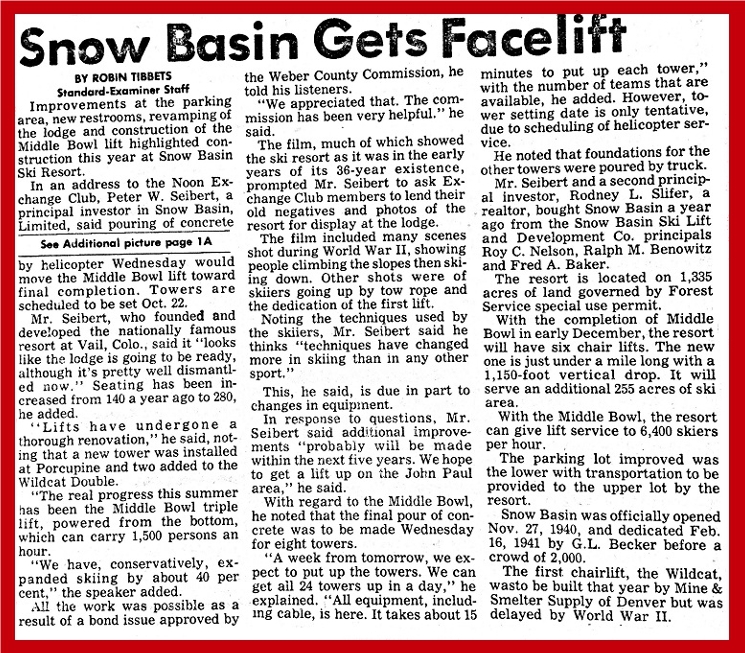 In the July of 1978, Vail founder, Pete Seibert made a bid on purchasing Snow Basin. 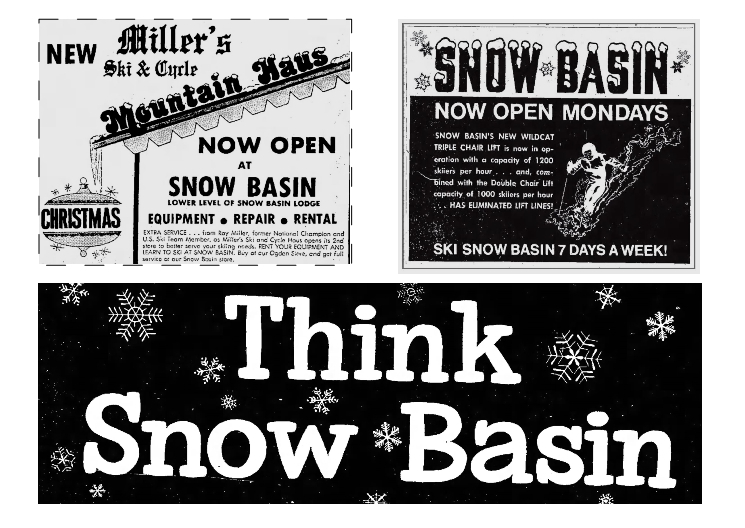 in early October the sale went though and Snow Basin had it's fourth ownership, Snow Basin Ltd. Pete Seibert was well know in the ski industry for founding Vail Resort in Colorado in 1963. 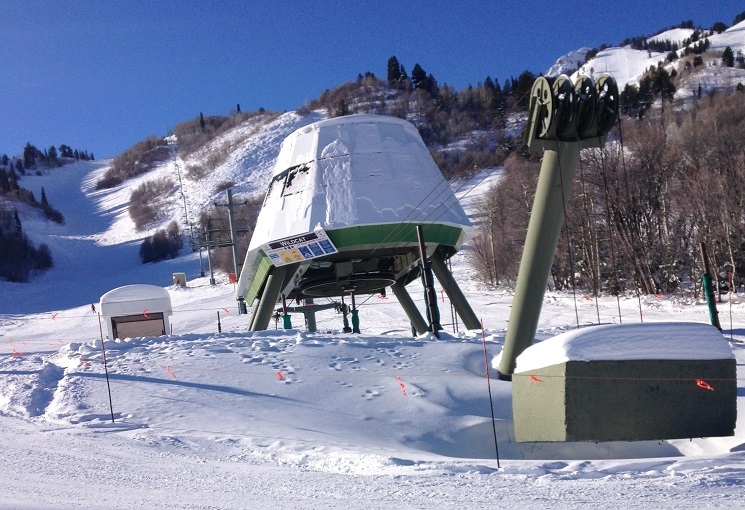 Originally planned to be installed for the 1974-75 season the Middle Bowl lift became a reality in the 1979-80 season. Built by CTEC, the Middle Bowl triple chair lift opened up a whole new area that was formerly only accessible by traversing from the top of Porcupine lift and traversing around Needles and then hiking. The Middle Bowl lift is 4600 ft. long – 1180 vertical - 1500 per hour. From the day it opened Middle Bowl was “the place to ski”. When the Needles Lodge was constructed, the unloading station had to be relocated. It was originally located approximately where the main entrance is now. Above: Ogden Standard-Examiner article from October 18, 1979. For the 75th Anniversary season the Grizzly Center has made available “throwback” T-Shirts, Hats, Stickers, Magnets, Coasters, Pins, and other items with the “SB Tree” logo as well as the St Bernard and the 75th Anniversary commemorative logo. 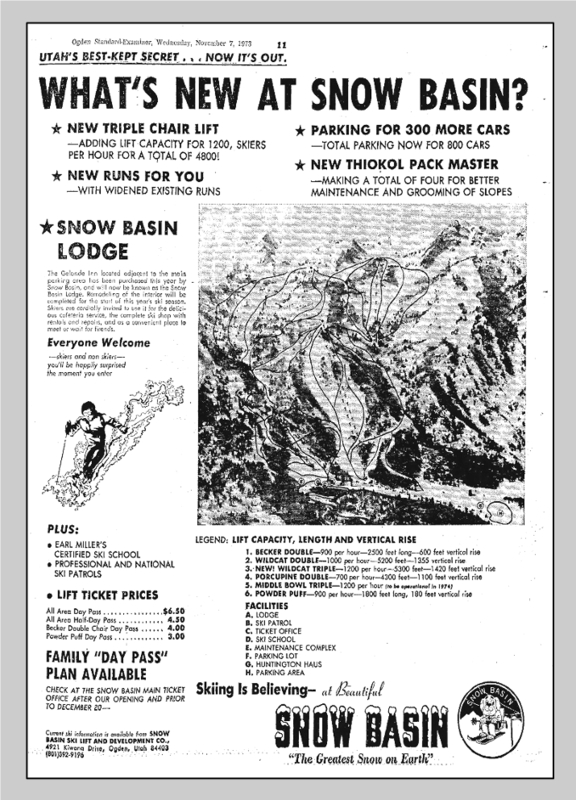 Snowbasin lifts and lodge at the end of the 1970's. This is a 2006 Google Earth arial map that I have marked the approximate location of the lifts and lodges that exhisted at that time. The Light Blue Lines denote current lifts and the Red Lines denote lifts as of the 1979-80 season. (1) Becker Double Chair Lift (2) Snowbasin Lodge (3) Wildcat Double & Triple Chair Lifts (4) Littlecat Double chair lift (5) Huntington Haus (6) Porcupine Double Chair Lift (7) Middle Bowl triple chair lift.